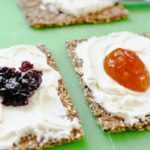 Cream cheese snacks are an easy 3 ingredients recipe perfect for the kids to make. 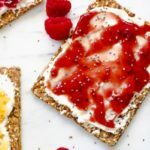 These are great for an after school snack, or a healthy treat. 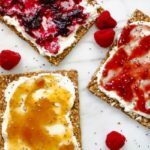 They’re made with seeds and grains crisp bread, whipped cream cheese light, raspberry, blueberry, and apricot preserves. 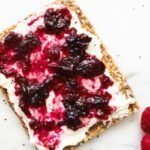 This would taste great with cream cheese and fruit slices as well. Cream cheese is a fresh soft cheese that is not aged. This tends to be a kids favorite due to it’s mild, and sweet flavor. It’s used for desserts, and savory dishes. The recipe ideas are endless for this yummy cheese. It has a short shelf life, and will only last about a week in the refrigerator after being opened. 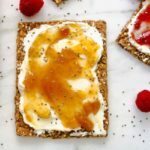 WHAT CAN I EAT WITH CREAM CHEESE? 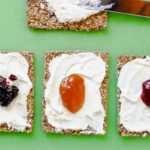 Since cream cheese is great for desserts, and savory dishes you will have many choices for recipes. I like to use them for snacks for the kids. Pinwheel sandwiches – For savory add some cucumber and sliced turkey, or chicken beast. For sweet, add a fruit preserve or fresh fruit. Celery sticks – cut celery stalk into 1/4 pieces and fill with cream cheese, sprinkle with paprika, chili lime salt, or cinnamon. No bake cheesecake – simple recipe, and easy for the kids to make. Check out our no-bake mini cheesecakes. IS CREAM CHEESE REALLY CHEESE? This is a question that seems to have people perplexed with the answer. After some investigating, I discover that it is in fact a cheese. It’s considered an unripened fresh cheese, and falls into a category of cheeses that are ready to consume immediately after production. Like mozzarella, ricotta, and queso blanco. 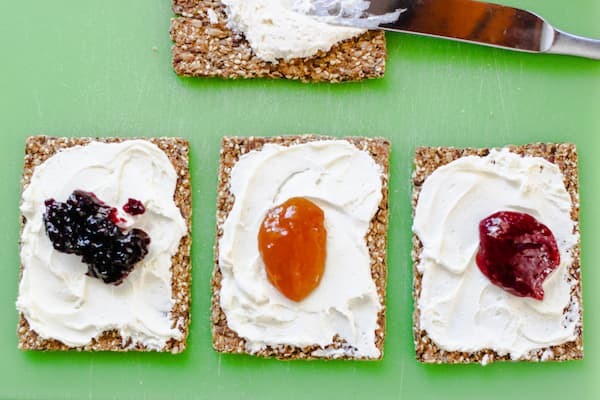 Want to make homemade cream cheese? Sounds like fun, let us know if you decide to give it a try. 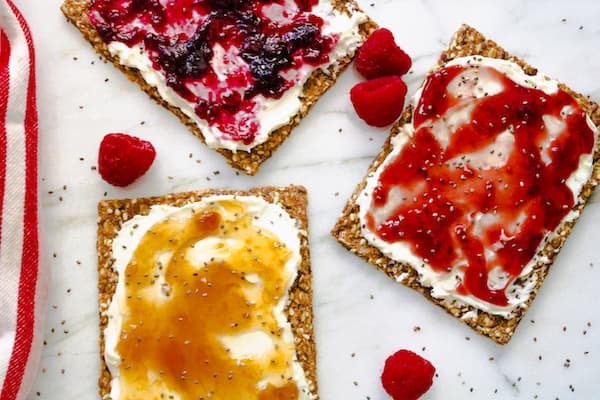 Look for a healthy cracker, low salt and sugar. 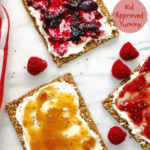 We used TJ’s Seeds & Grains Crispbread. 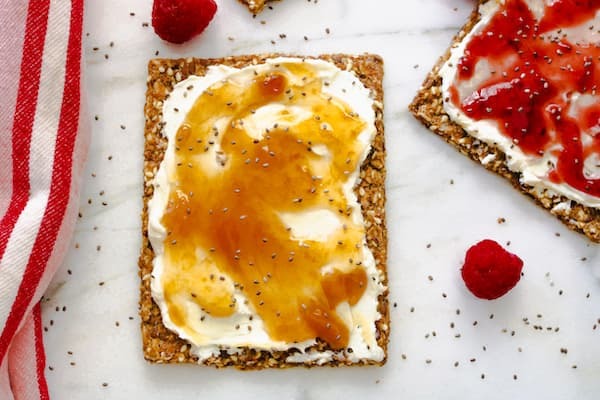 Use a whipped, or regular light cream cheese. Try a nut butter – almond, cashew, or peanut butter with fresh fruit slices on top. Cream cheese with fresh fruit. Make it savory with cream cheese and cucumbers, and seasoning. Turkey, or ham and cheese. Yum! Let us know if you make these, and leave us a comment below. 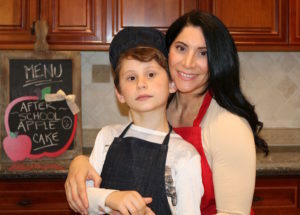 Come say hi on social media, Instagram @busylittlechefs. 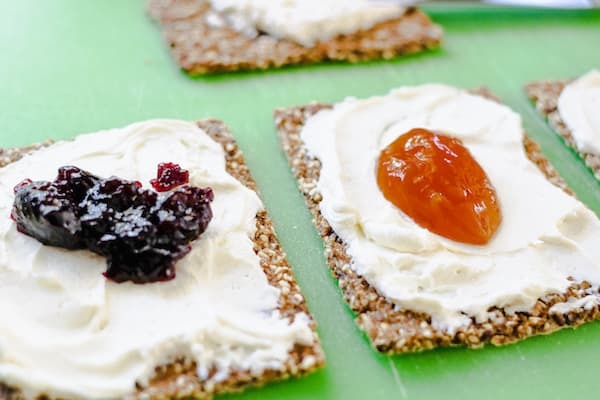 Cream cheese snacks are an easy 3 ingredients recipe perfect for the kids to make. 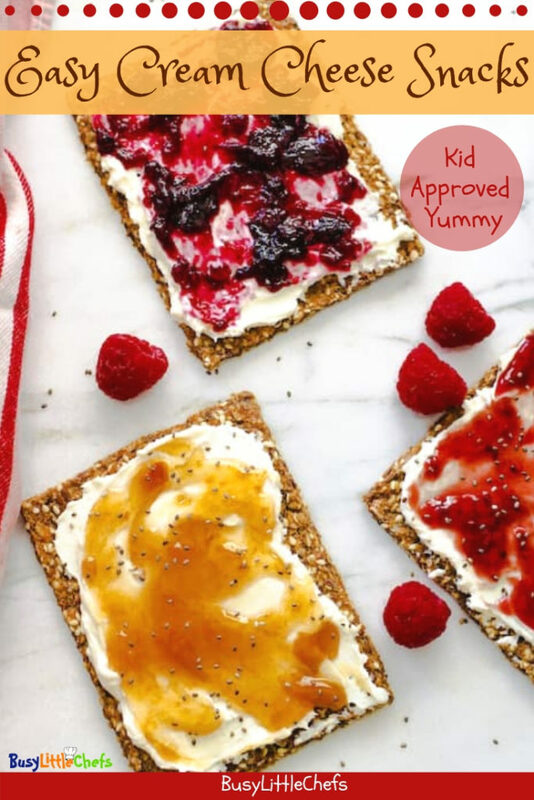 These are great for an after school snack, or a healthy treat. 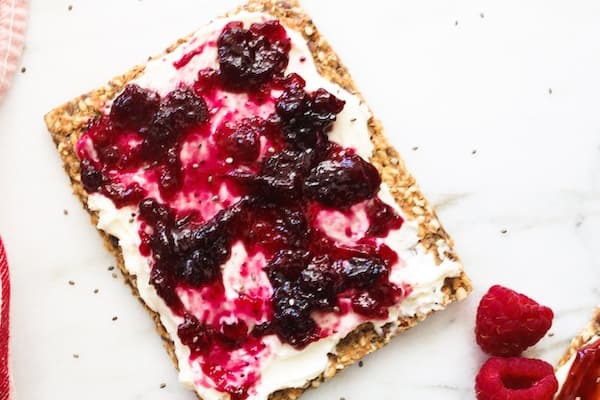 They're made with seeds and grains crisp bread, whipped cream cheese light, raspberry, blueberry, and apricot preserves. 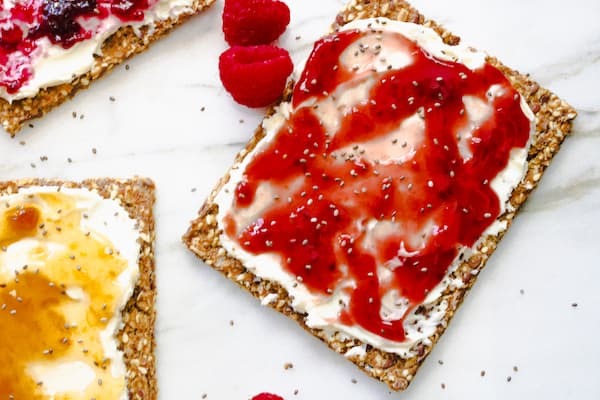 This would taste great with cream cheese and fruit slices as well.